Al Karak (Arabic: ? 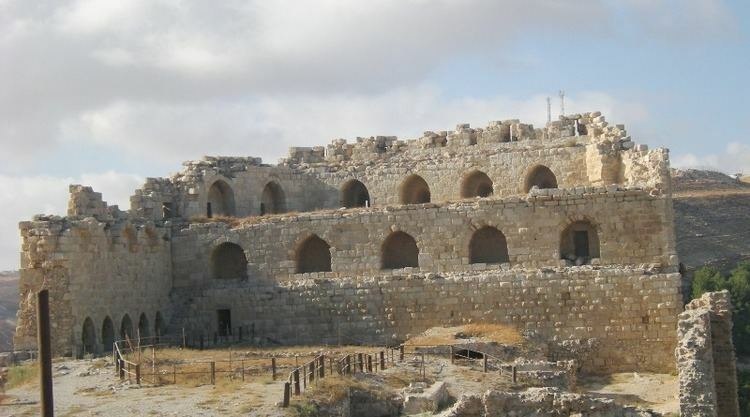 ), also known as just Karak or Kerak, is a city in Jordan known for its Crusader castle, the Kerak Castle. The castle is one of the three largest castles in the region, the other two being in Syria. Karak is the capital city of the Karak Governorate. Karak lies 140 kilometres (87 mi) to the south of Amman on the ancient Kings Highway. It is situated on a hilltop about 1,000 metres (3,300 ft) above sea level and is surrounded on three sides by a valley. Karak has a view of the Dead Sea. A city of about 20,000 people has been built up around the castle and it has buildings from the 19th-century Ottoman period. The town is built on a triangular plateau, with the castle at its narrow southern tip. Karak has been inhabited since at least the Iron Age, and was an important city for the Moabites. In the Bible it is called Qer Harreseth or Kir of Moab, and is identified as having been subject to the Assyrian empire; in the Books of Kings (16:9) and Book of Amos (1:5, 9:7), it is mentioned as the place where the Syrians went before they settled in the regions north of Palestine, and to which Tiglath-Pileser III sent the prisoners after the conquest of Damascus. In 1958 the remains of an inscription was found in wadi al Karak that has been dated to the late 9th century BC. During the late Hellenistic Period, Al Karak became an important town taking its name from the Aramaic word for town, Kharkha (Aramaic: ?. The area eventually fell under the power of the Nabateans. The Roman Empire – with support from the Arab Ghassanid tribe, or Ghassasinah – conquered it from them in 105 AD. The city was known in Late Antiquity as Harreketh. Under the Byzantine Empire it was the seat of a bishopric, housing the much venerated Church of Nazareth, and remained predominantly Christian under Arab rule. Its bishop Demetrius took part in the council of the three provinces of Palaestina held in Jerusalem in 536. Another, named John, is said to have existed in the 9th century. Karak is famous for its traditional Jordanian lamb dish called mansaf.